Fifty years, I am so anxious to see each of you! I graduated from Sibley (American University of Nursing), and have always been happy I chose that profession. In 1962 I married Richard Yobst, and we moved to Salisbury , MD two (2) years later where he started his head football coaching career. It was a great life, and I never missed a high school or college game. 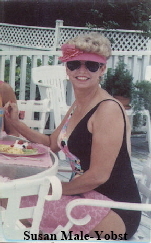 In the late 60’s I became a Christian, and was active in Christian Women’s Clubs as a speaker. In 1971, a banner year, our long awaited “family” begins with the birth of our son, Derek Christian. In 1974 our daughter, Dana Joy, joins us. Being a wife and mother was such a joy to me. We grew as an active happy family through the 70’s, 80’s and early 90’s. We spent lots of time in and on the water in our boat, and are all PADI certified scuba divers. During this time I worked part time directing a women’s clinic at the university. We were divorced in 1999 at Richard’s initiative. My son, Derek (37 years old) has been married for 10 years to a wonderful girl he met in college, Kim. Best news, I’m a grand parent, long desired. Samantha Riley is 1.5 years old. I see Sam weekly, and love being Mom-Mom. Deke is hanging up his cleats this season, having played semi-pro baseball since college graduation. This will be my first season without a “game” to go to since 1957. Daughter, Dana (35 years old) is presently finishing a 6 month back packing trip thru South America. She lives in San Franciso, CA and is not married. After graduating college she has worked in high stress, high dollar international technology – and periodically quits her job, puts on her backpack and travels, - 6 months in Africa, 2 years in Asia. She and I backpacked in Australia and New Zealand, staying in hostels all the way. That brings you up to 2009. I will be in Egypt for a month, but will be back in time to see you! Maybe I’ll bring back an antiquity, me.